When you’re at the county fair, you see and smell many different things, don’t you? You see cows, horses, ducks, chickens, bunnies… and then you move into the ride section, where you see all sorts of rides, the tallest a Ferris wheel… and then what? What do you smell? You smell food – all kinds of food! Most importantly, you smell funnel cakes. As you run over to the stand, you order a funnel cake and watch as they pour all of that powdered sugar onto that sweet warm cake… and then they hand it to you and you immediately dig in, tasting that sweet sensation nothing else can replace. Then you wonder: why can’t I have these more often, instead of having to drive to a fair to get one? 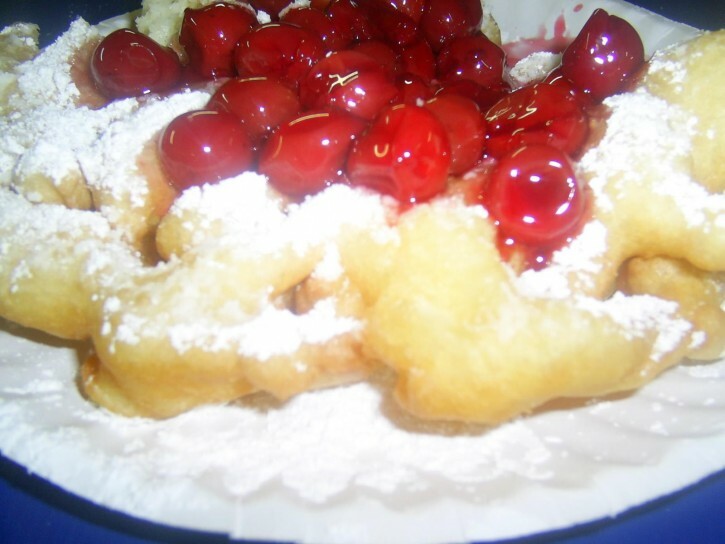 Now, you can have them more often, with this easy funnel cake recipe! Just follow the directions and you’ll have yourself a funnel cake in no time! In a deep skillet, heat two cups of oil over medium-high heat until hot. Test the temperature by dropping a pinch of flour into the hot oil: if it sizzles right away without smoking, it’s just right. Beat eggs and milk in a bowl. Then, in a separate bowl, mix all the other ingredients in a separate bowl and slowly add to the egg mixture. Make sure to beat until smooth. Using a funnel, drop into hot oil working from center outwards in a web pattern. Note: if you don’t have a funnel, you can use a gallon sized freezer bag instead of a funnel by pouring the batter into the bag, snipping a small corner off of it, and squeezing the batter into the oil. Cook the funnel cake for about two to three minutes, and then remove from the oil when golden brown and crispy. Sprinkle with as much or little powdered sugar as you’d like. You also top with chocolate or fruit and serve! I hope you enjoy this recipe! I know I definitely do.